Even a contractor with an exhaustive education will not know how to deal with problems like the seasoned contractors at Brock Doors and Windows. Over the years we have gained countless tricks, tips and know-how from over 70,000 quality installations for customers, and we continue to rely on that experience every day. Truly great windows and doors contractors don’t have to talk about themselves, because their customers do it for them. When people have a positive experience with a window or door contractor, they are more than happy to leave a glowing review or testimonial. Reading both positive and negative reviews like these gives you a very good idea of the character of the contractor. Brock Doors and Windows has positive reviews and testimonials in the thousands that you can view right on our website. Respect is just as important between homeowner and contractor as it is between two people. We promise to always treat you and your home with as much respect as if it was our own. You are inviting us into your home and personal space, and we take this very seriously. This means, we will always respect your time, concerns, and budget, keeping our word with arrival times and project cost, maintaining proper safety requirements and procedures, as well as making sure that your home is just as clean and tidy as we found it—if not more. We will go out of our way to ensure that every aspect of the project meets or exceeds your expectations and any concerns you have get addressed. Most people are familiar with the (BBB) Better Business Bureau. The BBB accredits contractors that rise to meet specific standards of excellence in their industry. Having accreditation always shows that a contractor is more trustworthy. If a window and door contractor tries to charge you for a project estimate or an initial consultation, run as fast as you can in the other direction! A good contractor should always be willing to address any questions and concerns before you even hire them, and they should never charge you for a consultation or estimate. 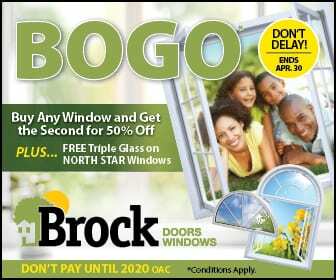 Let the professionals at Brock Doors and Windows give you a hand with your Brampton, ON replacement windows project. Please feel free to call us today for your free, in-home consultation!